Our study included 22,234 children aged less than 59 months in El Salvador, Guatemala, Honduras, Mexico, Nicaragua, and Panama. Child vaccination cards were used to calculate coverage of measles, mumps, and rubella (MMR) and to compute the number of days lived at risk. A child had a missed opportunity for vaccination if their card indicated a visit for vaccinations at which the child was not caught up to schedule for MMR. A Cox proportional hazards model was used to compute the hazard ratio associated with the reduction in days at risk, accounting for missed opportunities. El Salvador had the highest proportion of children with a vaccine card (91.2%) while Nicaragua had the lowest (76.5%). Card MMR coverage ranged from 44.6% in Mexico to 79.6% in Honduras while potential coverage accounting for missed opportunities ranged from 70.8% in Nicaragua to 96.4% in El Salvador. Younger children were less likely to have a missed opportunity. In Panama, children from households with higher expenditure were more likely to have a missed opportunity for MMR vaccination compared to the poorest (OR 1.62, 95% CI: 1.06–2.47). In Nicaragua, compared to children of mothers with no education, children of mothers with primary education and secondary education were less likely to have a missed opportunity (OR 0.46, 95% CI: 0.24–0.88 and OR 0.25, 95% CI: 0.096–0.65, respectively). Mean days at risk for MMR ranged from 158 in Panama to 483 in Mexico while potential days at risk ranged from 92 in Panama to 239 in El Salvador. 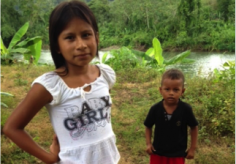 Our study found high levels of missed opportunities for immunizing children in Mesoamerica. Our findings cause great concern, as they indicate that families are bringing their children to health facilities, but these children are not receiving all appropriate vaccinations during visits. This points to serious problems in current immunization practices and protocols in poor areas in Mesoamerica. Our study calls for programs to ensure that vaccines are available and that health professionals use every opportunity to vaccinate a child.